The Studio has a small shop area which visitors are welcome to come and browse. 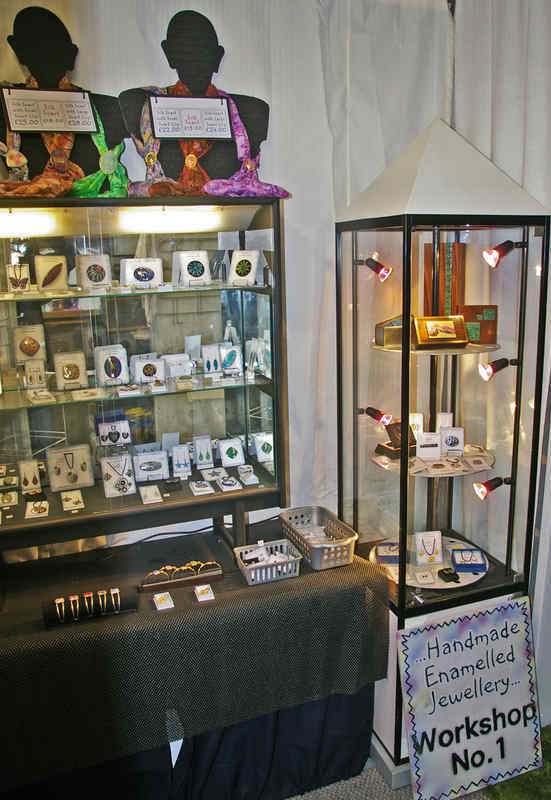 A wide range of my jewellery and other enamelled items are always on show. From small bookmarks to larger pieces such as boxes decorated with enamelled panels, hand-painted silk scarves which co-ordinate with my scarf clips and my 'Second Chance' slightly imperfect jewellery at greatly reduced prices (from £5) there surely is something for everyone! Also open on some Saturdays & Sundays when suitable events are being held on site. See events page for details. Other times by prior appointment only. Please note: Opening times may be subject to variation without notice. It is always advisable to check that the workshop is open by calling 07759 122984 before making a special journey. The studio is one of three small workshop units at Avoncroft Arts Centre, Stoke Heath, Bromsgrove, Worcestershire. The Arts Centre is situated directly off the A38 bromsgrove bypass. From the north (Birmingham) pass Morrison's superstore and continue uphill. Go over the brow of the hill and in a short distance you will see a large sign (pictured below) on the left, just before the pedestrian crossing turn into the drive. From south (Droitwich/Worcester) turn right at the roundabout approaching Bromsgrove to continue on A38. Proceed uphill to traffic lights at Hanbury Turn pub, go straight on and almost immediately turn into Arts Centre drive on the right just after the pedestrian crossing. (see map below). There is a car park at the end of the drive. A brick path around the left side of the building leads to the studio. 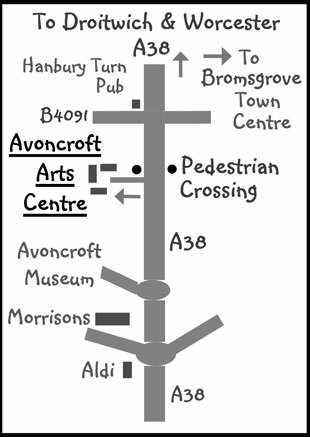 Please note: Avoncroft Arts Centre and Avoncroft Museum are separate places. Neither can generally be accessed from the other.